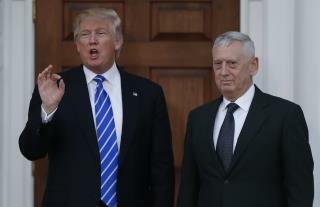 (Newser) – Sources tell the Washington Post that Donald Trump has picked a "Mad Dog" for secretary of defense. That's just one of the nicknames held by retired Marine Gen. James Mattis, who CNN notes is also known as the "Warrior Monk." Apart from spending four decades with the Marines, Mattis was recently the chief of US Central Command—a role in which he clashed with President Obama over Iran—and spent time as the supreme allied commander of transformation for NATO. John McCain has called Mattis "one of the finest military officers of his generation and an extraordinary leader." He has a "cult-like following" among infantry Marines and soldiers, the Military Times reports.